The Mentor’s Project provides role models for encouragement and motivation to eligible Bibb County Public Middle and High School students who need additional support outside their family, and to assist them in reaching their full academic, social, and personal potential. With your help, The Mentor’s Project has been successful in steering students away from drugs, crime, and dropping out of school. In addition, students mention that mentors have helped them to control their temper, get along better with family members and teachers, and improve their social skills, grooming habits, and overall outlook on the future. Nearly 100% of the proteges who graduate from high school with an active mentor will attend a post secondary institution and become productive members of the community. 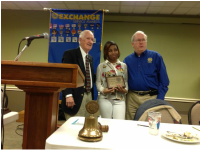 The Mentoring Project of Bibb County – Community-Based Student Mentoring Results! Make a difference in a child’s life and become a mentor in the Bibb County Student Mentoring Program. Support The Mentor’s Project by sponsoring or attending one of our events.